One of the four Gateway Quadrant sectors created by Judges Guild in support of their adventures. 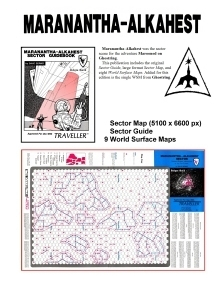 Each sector included a 22 x 28 inch sector map, a supporting 24-page booklet with individual subsector maps and world UWPs, and (on the back of the sector map) several world surface maps. This title was added to our catalog on January 14, 2011.